Top 5 Online Slots with a Fantasy Theme | Spin & Win! While it’s pretty amazing how many instant games there are out there, it can be hard to choose which ones to play. There are slots covering a huge variety of genres and themes and sometimes narrowing down which you prefer most can make it easier to find your favourites. When playing online slots at most bingo and casino sites, you’ll get to choose from action, adventure, animals, fruit, TV & movies, fantasy and more themed games. In this article, we’ve reviews 5 of our favourite slots with a fantasy theme. 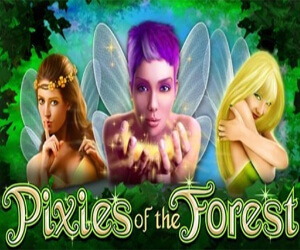 This magical slot takes you deep into a lush forest where the beautiful pixies live. There are 5 reels and 99 paylines for bigger winning potential plus excellent bonus features. The Tumbling Reels and Free Spins Bonus offer extra chances to boost your bankroll! You’ll be mesmerized at the magic of White Wizard slots! The enchanting visuals and sound effects set the stage for a fantastical slots experience filled with amazing spins! The reels are packed with Wizards, Dragons, Cauldrons, and Unicorns and special symbols that can help you win more. Trigger free spins and multiplier bonuses for the biggest wins! Kiss the frog and it just might turn into a handsome prince! That’s the storyline of Enchanted Prince slots, based on the well known childhood fairytale. The symbols are all reminiscent of the story and include a frog, princess, castle, and water lily leaf. The frog is the Scatter symbol and can reward you with up to 25 free spins and up to 50x multiplied wins! Go deep into the enchanted wood when you play The Magical Forest slots. The symbols include witches, fairies, spell books, bubbling cauldrons, potions, and toadstools which adorn the 5 reels and 25 paylines! The Spider bonus symbols can activate special features and the Centaur scatter can multiply your winnings up to 100 times! Spellcast is a charming slot game from NetEnt featuring magical wizards and mesmerizing chances to win! The graphics include witches, warlocks, wizards, potions, wands and more to set the stage for the most enchanting spins. The Crystal Ball scatter symbol will award you with 15 free spins with tripled wins. The Wizard Wild symbol can replace other symbols and pay out up to 10,000 times your wager when you get 3, 4, or 5 on the reels! Make sure to boost up your bingo games sessions by playing some of the best fantasy slots online!